Among other changes, the new regulations set hard limits on the size and height of new single-family homes, and require certain trees to be saved on homebuilding sites. Mercer Island, one of the most expensive real-estate markets in the country, is limiting the development of mansions with new restrictions that go further than any other local city in capping the size of huge homes. The regulations, passed 5-1 by the island’s City Council late Tuesday, are the result of a yearlong effort to address residents’ concerns about gleaming new mega-homes towering over single-story ramblers built half a century ago. It’s the latest in a long line of fights in the town to limit development. Most other cities in King County don’t restrict home sizes the way Mercer Island does, and those that do allow for bigger homes. Homebuilders say it could push wealthy owners to build estates elsewhere in the region, increasing sprawl. And one council member who opposed the changes said the island could lose out on CEOs moving there. The new law only applies to future construction and major remodels of single-family homes — so houses that are already built won’t be forced to downsize, and apartment development won’t be affected. Starting in November, the size of new houses will be capped based on how big the lot size is, with the largest houses still on the waterfront and smaller ones in the middle of the island. Typically, homes will be limited to 40 percent of the lot size, down from the previous 45 percent. Since lots on the island are so huge, the change adds up: The median new house would be cut by 600 square feet, or 11 percent. That alters the potential value of a home by hundreds of thousands of dollars. For instance, the typical Mercer Island home just under 4,500 square feet sold for about $2.03 million within the last year. But downsized to 4,000 square feet, the median house price falls to $1.78 million, according to Seattle-based real-estate site Estately. Evan Maxim, the island’s planning manager, said the changes were proposed after an influx of developers in recent years began buying smaller, older homes on large lots and tearing them down, and putting up two big modern homes in their place. The island has been getting about 250 new houses per year during the region’s current development boom. Still, the changes won’t eliminate the mismatch of new and old homes — just make the new ones slightly smaller. Most cities in King County don’t cap home sizes by lot size. Those that do — generally, other ritzy areas like Bellevue, Medina and Clyde Hill — let developers build up to 45 or 50 percent of the lot size, according to the Master Builders Association of King and Snohomish Counties, the local homebuilding group opposed to the new regulations. 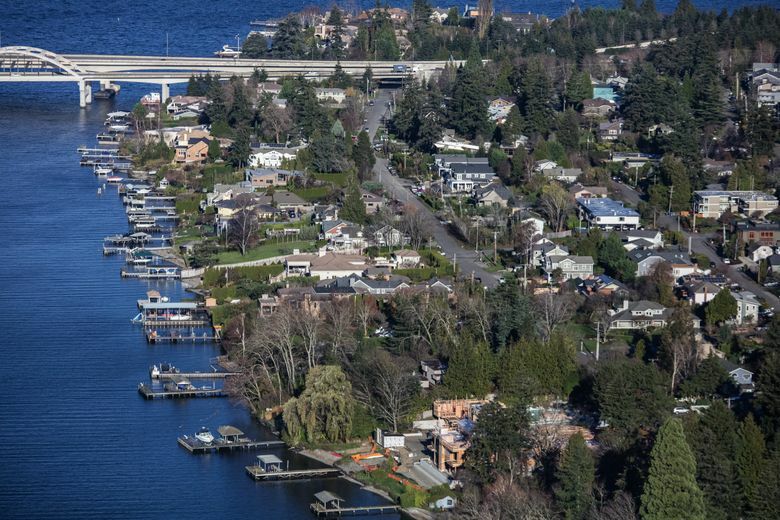 Mercer Island’s changes also cut the maximum height of homes on downhill slopes from 35 to 30 feet. And they require certain trees on homebuilding sites to be saved, potentially limiting the size of houses further. There is also a hard ceiling on the total size of homes, meaning developers won’t be able to simply build endlessly by combining huge lots. “This is well beyond what any other cities have done,” said David Hoffman, the homebuilder group’s local manager of public affairs. Councilwoman Wendy Weiker, who cast the sole vote against the regulations, unsuccessfully pushed for an exemption to allow for mega-mansions along the prized waterfront. She noted Bill Gates’ home across the water in Medina is nearly 50,000 square feet, which would be blocked under Mercer Island’s new regulations. The island is already home to many rich people, most notably Paul Allen. The median household income there is $126,000, and the typical single-family home costs about $1.5 million. The island will still allow for homes of 10,000 to 12,000 square feet on supersized lots along various parts of the waterfront. For perspective, that’s about four times the average size of new-construction homes in Seattle. Even Allen’s biggest house on the island would be allowed under the new rules (he has multiple properties there). “I’m hard-pressed to imagine that someone really needs a home that’s larger than 12,000 square feet,” Bassett said. Hoffman argues the size limits on homes won’t appease residents worried about huge houses. To meet the new standards, he said, architects will often have to build taller, skinnier homes that aren’t as aesthetically appealing. “You can build a 30-foot-tall box,” he said. He noted the law followed other moves by the city to limit growth, including low building heights near the city’s planned light-rail line, at a time when other cities in the region are allowing more density. The town has also had debates over development moratoria in the Town Center in recent years. Maxim and Bassett said the city tried to strike a balance between critics of the changes and those who wanted to limit home sizes even more. Officials will be reviewing the effects of the changes every few months. Carolyn Boatsman, one resident pushing for the changes, said she was glad the house sizes were reduced but did not think the council went far enough, particularly on height limits, to protect neighborhoods. “People aren’t looking for no change, but we’re saying the scale of it is off the charts,” Boatsman said. “We think it should be more modest, so we continue to be a forested community, where you walk down the street and aren’t overwhelmed by” huge houses.